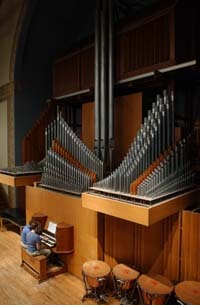 Syracuse University’s College of Visual and Performing Arts (VPA) and the Syracuse chapter of the American Guild of Organists will celebrate the 60th anniversary of SU’s historic Holtkamp organ on Sunday, Nov. 21, with two concerts in the Rose and Jules R. Setnor Auditorium, Crouse College. Both events are free and open to the public. Parking is available in the Irving Garage. On Nov. 21 at 8 p.m., Will Headlee G’53, SU professor emeritus of organ, will perform a recital of pieces he particularly connects to the Holtkamp organ. These include works by Lübeck, Bach, Franck, Bingham and Messiaen. Setnor Auditorium’s organ was rebuilt by Walter Holtkamp in 1950 and dedicated on Nov. 13 of that year by Arthur Poister, then-professor of organ. The organ consists of 3,823 pipes, some of which are from the original organ built by Frank Roosevelt in 1889 and rebuilt by the Estey Organ Co. in 1924. The organ’s visual design and musical effectiveness have drawn visitors from all over the world. It was awarded a Certificate of Historic Merit by the Organ Historical Society (OHS) in 1989. It is the youngest organ to receive an OHS citation. For more information about the concerts, contact the Setnor School at (315) 443-2191. Watch live Setnor School of Music concert performances at http://vpa.syr.edu/music/live-performances.